If you listen closely, you can hear a collective sigh of relief come across Colorado, as spring rain and snow continue their welcomed deluge on a parched, water-scarce state. Brush-clearers are taking a break from trimming, their fear of summer fires placated, if only momentarily. City officials are beginning to think more about flash floods than smoking forests. Would-be hikers are exclaiming, “Thank god, now we can have campfires!” (tempting fate, to be sure). The excitement is certainly justified. Mountain snowpack, which accounts for 90% of Colorado’s water, is up by 366% compared with this time last year. Precipitation on the eastern plains is also up; by the second week of the month, the state had already surpassed its April precipitation average. Granted, a whopping two inches isn’t much of a bar to vault, but the news is encouraging nonetheless. 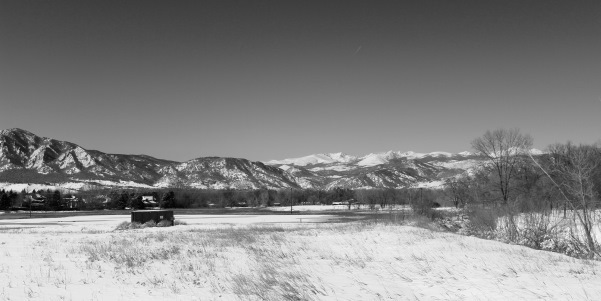 In light of this newfound easing of precipitation poverty, water usage should be given a renewed consideration in connection with hydraulic fracturing along the Front Range. The town of Longmont has already banned fracking, following the passage of Ballot Question 300 in November. Other bans are in the works: the Boulder City Council will vote on June 4th on a five year moratorium and, as Bloomberg reported earlier this month, the state’s General Assembly is voting on substantial regulation overhaul against the oil and gas industry. While environmentalists are encouraged by municipal and state efforts to contain fracking, the rhetoric and motivations for resisting the industry are misplaced in a state where water is such a scarce resource. Justification for banning fracking most often rests on cries of pollution, unpredictable seismic consequences, and—the most vocal, yet most unconvincing argument—Not In My Backyard. Arguments against the practice that employ sheer arithmetic of available water versus water needed for fracking seem to be secondary at best. It is too early to tell Colorado’s overall available water levels for 2013, at least in terms of reservoir contents and continuous precipitation (there are those other seven months to go, after all). We do know that the northern counties are doing better so far—but since snowpack is still accumulating in the mountains, runoff hasn’t begun, so reservoir levels can’t be known. But what we do know are the monstrous quantities of water fracking operations employ. One vertical well needs one million gallons, while a horizontal well needs five times that amount, according to the Colorado Oil and Gas Association. Industry advocates point out that the total amount used by the 43,000 fracking wells in the state is far less than what residential areas use. However, most water from homes is reprocessed and reintroduced to the overall supply, something not possible with most fracking waste. Considering that the given expansion of the Gross Reservoir is equivalent to the amount of water needed for fracking in coming years (18,000 acre-feet per year, according to Western Resource Advocates) water shortage should be the primary complaint resonating from anti-fracking campaigns. Instead, public outcry—if one follows local campaigns in Ft. Collins, Colorado Springs, Longmont and Boulder—is emphasizing water and air pollution. That is not to say contamination of water tables isn’t a dire concern with such an explosion of fracking in the state (the fourth largest oil and gas producer in the country). But increased water testing and removing exemptions from the Safe Drinking Water Act can only be effective if there is still water unused by fracking itself. The current round of local fracking bans and city council deliberations has gone forward smoothly relying on NIMBY and pollution arguments. But the oil and gas industry is never fond of complacent repose, and lawsuits to overturn bans have already begun. The Colorado Oil and Gas Association are taking Longmont’s ban to task; similar efforts will surely follow Boulder’s vote (which, knowing the Boulder demographic and their penchant for All Things Green, will pass) as well as the efforts in Ft. Collins and Colorado Springs. Given that Colorado now has the chance to recover from two straight years of drought, comprehensive, but simple, arguments based on the arithmetic of state water availability need to be the backbone of the next round of resistance to lawsuits, if only for the sake of drinking water, a flash flood here and there, and the warmth of a campfire among friends.